French and Indian Wars Summary and Definition: The French and Indian Wars (1688-1763) was a bitter series of battles stretching over a period of 75 years between Great Britain and France for the possession of North America and their Indian allies from the Eastern woodlands tribes. The French and Indian Wars were so named because because of the importance of Indian participation in these conflicts. The Iroquois confederacy of Native Indians were allied to the British and most of the Algonquian speaking tribes referred to as the Wabanaki Confederacy were allied to the French. 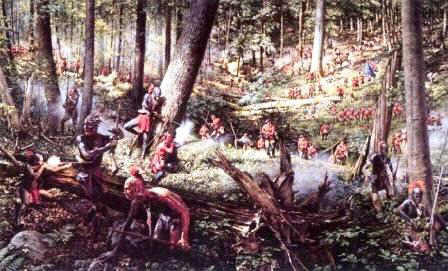 The French and Indian Wars culminated in the Seven Years War that ended the contest between the French and British bringing victory to Great Britain. The French and Indian Wars was a generic name for a series of wars, battles and conflicts involving the French colonies in Canada and Louisiana and the 13 British colonies consisting of King William's War (1688-1699), Queen Anne's War (1702-1713), King George's War (1744 - 1748) and the French and Indian War (1754-1763). The effect of the French and Indian Wars helped to bring about important changes in the British colonies. The American colonies felt less dependent militarily on the British by the end of the French and Indian Wars. The American Colonists became more concerned with their own problems than that of the 'Mother Country' and put greater value on their own institutions. Following the French and Indian Wars British incurred a massive war debt which led to them reversing their policy of Salutary Neglect that ultimately led to insurrection in the colonies, the Boston Tea Party, the American Revolution and the Declaration of Independence. This short History Timeline of the French and Indian Wars provides fast facts and information about the history, years & dates, key events and famous people who fought in the French and Indian Wars. 1710: The British captured of Port Royal in 1710 that resulted in the French lands called Acadia becoming the British province of Nova Scotia during the French and Indian Wars. 1713: The Treaty of Utrecht ends Queen Anne's War by which Great Britain acquired Newfoundland and the Hudson Bay region from France during the French and Indian Wars. 1748: The war ended King George's War with the Treaty of Aix-la-Chapelle that restored conquered territory but failed to resolve colonial issues. 1763: The Treaty of Paris ends the Seven Year War (1754-1763) and the French and Indian Wars. Canada, east of the Mississippi River, was added to the British empire.